Wuxi, once a prosperous commercial center in China, now takes a backseat to other cities along the Yangtze River like Suzhou and Yangzhou. 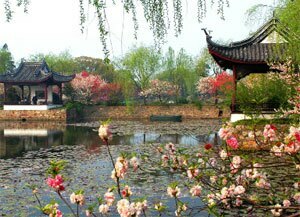 Yet due to its long history and the great location, Wuxi still has much to offer travelers. It’s natural scenery and historic sites as a pearl along Taihu Lake make it an ideal side trip when visiting Shanghai, Suzhou or Hangzhou. The city is bordered by the famous Taihu Lake and the Grand Canal also passes by the city and has been an influence on its prosperity for thousands of years. The most notable Wuxi attractions are near Taihu Lake. The following attractions are considered as must-go places when visiting Wuxi. 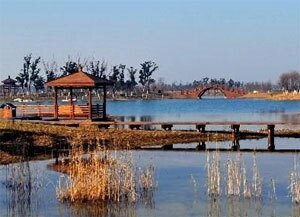 Turtle Head Isle is one of the most notable scenic spots in the Taihu Lake area. Reclining in northwest Taihu Lake, it the isle resembles a turtle raising its head and hence the name. It is a good place to appreciate the beautiful lake and enjoy delicious local food. There are many spots in the scenic zone if you have the time to investigate. Climb to Shutian Pavilion for a lovely lake view, walk around the isle on the flowery path, let your feet enjoy the water at a shallow beach or take a boating on the lake to feel the breeze on your face. The isle is especially beautiful in May when the cherry blossom is out. Getting there: Take Bus 87 and get off at Yuantouzhu (Dushan) Station (鼋头渚犊山站). Taihu Lake is one of main 5 freshwater lakes in China and located in South Jiangsu and connects to Zhejiang Province. It is the second biggest freshwater lake in China. The whole lake resembles a crescent facing the East. Featuring abundant plant and animal life, the scenery around the lake varies from season to season attracting many visitors. Wuxi section of the lake is the most famous and beautiful and a cradle of Wuxi culture. Often when people talk about Taihu Lake, they are referring to the Wuxi section. The famous Turtle Head Isle, Dongshan and Xishan are all accessible for a day trip. Getting there: Take Bus NO 4 and get off at Taihu Lake Resort Station (太湖山庄站). The main scenic spot in Wuxi, Lingshan has several interesting attractions to see. The first sight is Zhaobi, a big screen wall. Various Chinese characters are carved on the wall. It is the biggest screen wall in China. 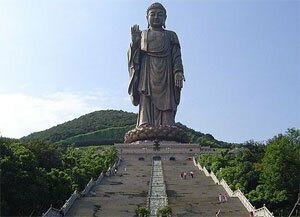 The famous Giant Buddha at Lingshan, also known as the Oriental Giant Buddha, is the tallest Buddha in China. People believe the Buddha symbolizes happiness and blessings. The Vatican Palace is an impressive place built as a conference center. It contains many valuable western and Chinese mural paintings. Getting there: Take Bus NOs 88/89 and get off at Lingshan Shengjing Station (灵山胜境站). Liyuan Garden is on the shore of Li Lake. The lake has a story set during the Spring and Autumn and Warring Period which says that Fan Li and Xishi went boating on the lake. Fan Li who was a prime minister in the Spring and Autumn Period and named after him. Three sides of the garden are surrounded by the lake. Divided into 3 main scenic areas, Liyuan Garden has several spots of interest - Man-made hills representing mountains, a long dike and the Four Seasons Pavilions. There is a stone path leading visitors through the garden which it is at its best during spring and autumn. First-time travelers may feel that the path is like a maze, but it is designed to display the changing lake views. Getting there: Take Bus 1, 82 and get off at Liyuan Garden Station (蠡园站). With a history of over 2,500 years, the Beijing-Hangzhou Great Canal is the oldest and longest man-made canal in the world. It is one of the greatest projects from Ancient China, together with the Great Wall. It is 1794 km long but now only 883 km are useable; basically the parts of the canal in Shandong Province, Jiangsu Province and Zhejiang Province. 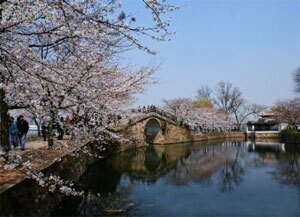 The Wuxi section of the Beijing-Hangzhou Great Canal is considered to be the most spectacular part. The river surface is wide and the old rice market still exists along Sanli Bride area. 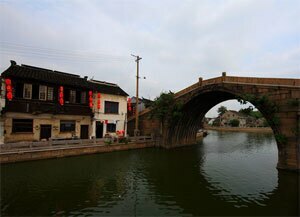 The essence of the Great Canal at Wuxi is the south section, where the houses along the river are ancient with the water town characteristics. The Xihui Area is located west of Wuxi City, near Mount Xi, Mount Hui and the other beautiful gardens. It combines history sites and stunning natural scenery. 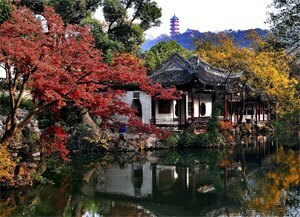 The main attraction of the Xihui area is Xihui Garden, which combines history, cultural and a beautiful characteristics of an old Chinese garden. Being thousands of years old, it enjoys the reputation of being a history museum in the open air. The Second Fountain under Heaven is a famous spot in the garden, has a poignant story about it accompanied by music— Moon Reflecting on the Second Fountain (二泉映月). Visitors are able to climb up to the top of Mount Xi, which is the highest point in Wuxi. Getting there: Take bus NO. 611 and get off at Long Guang Road Station (龙光路站). Jichang Garden in Xihui Park is a classical southern garden famous for its natural hills, crystal clear water, elegant garden design and, big original trees. The overall layout is designed based on the hills and pools, including man-made spots and natural areas. The buildings are skillfully designed to highlights every spot with water elements. Ba Yin Jian is like a musical stream and one of the most notable sights in the garden. Jichang Garden was a model for the Garden of Harmonious Interests at the Summer Palace and Double Cranes Building at the Old Summer Palace. 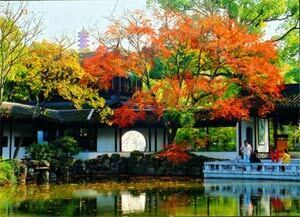 Qianlong, a successful and famous emperor during the Qing Dynasty, loved the garden and visited the garden 6 times during his 7 visits to Jiangnan area. He wrote poem expressing his appreciation of the beauty of the garden. Getting there: Take bus NO. 611 and gets off at Long Guang Road Station (龙光路站). Plum Garden is short for Wuxi Rong Family’s Plum Garden. 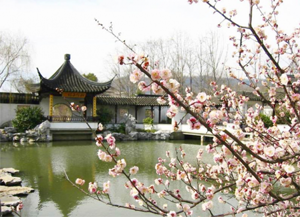 Located at Dongshan and Hushan on the western edge of Wuxi City, the garden is full of plum trees and therefore particularly beautiful when the plum blossoms bloom. Before China’s liberation the garden was a private garden belonging to Rong Yiren, a famous red capitalist. There are more than 5,500 plums trees of various kinds including as Yudie Plum, Gongfen Plum, Zhusha Plum and Mo plum. Each variety has different and some plum bonsais are also included. Getting there: Take bus NOs 2/3/40/52/53/67/72/83/87/88/89/106/112/131/158/310/766 and get off at Plum Garden station (梅园站). Built during the Nan Dynasty when Emperor Liang ruled the country (464-549), Nanchan Temple was originally called Huguo Temple. Though the name has been changed several times, most people like to call it Nanchan Temple because of it is located at the South Gate of the city. An ancient pagoda in the temple is 47.4 yards tall and has 7 stories. For entrance fee of 10 Yuan one can climb up the pagoda for a good view of Wuxi. On sunny days the shadow of the pagoda reaches a bridge miles away from the temple and is called Pagoda Shadow Bridge(塔影桥).There are stories about the pagoda and the temple, which add mystery Nanchan Temple. In 1980’s, the area around the temple became a cultural and commercial center. 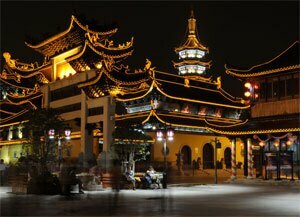 In modern-day Wuxi, Nanchan Temple Area has become a popular place to visit for shopping. Miaoguang Street(妙光街) is the most famous area. Getting there: Take bus NOs 1/5/12/15/19/23/24/25/27/32/42/51/53/55/57/62/85/92/105/312/358/501/502/508/765/767 and get off at Chaoyang Square Station (朝阳广场站).